Plated hex nuts and flatwashers add a clean, detailed, stock look to all Shovelhead Harley Davidson 1966-1984. Replaces OEM #'s 6702, 7753. 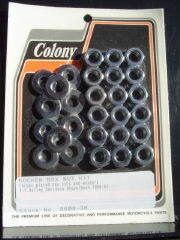 Colony Stock #'s 8608-36 & 8609-36.